Like a lot of great ideas, Peter Bellerby’s was hatched in a Kings Cross pub. After a fruitless, two-year search for the perfect globe, worthy of his father’s 80th birthday, he decided one night to take matters into his own hands. This was no overnight journey though. Along the way, many questions had to be answered with no previous experience to draw on. How do you get a large ball balanced with lead weights through customs? How do you actually balance the ball in the first place, so that it comes to a natural rest after spinning? For Bellerby, figuring out all of these challenges was like finding small treasures along the way. 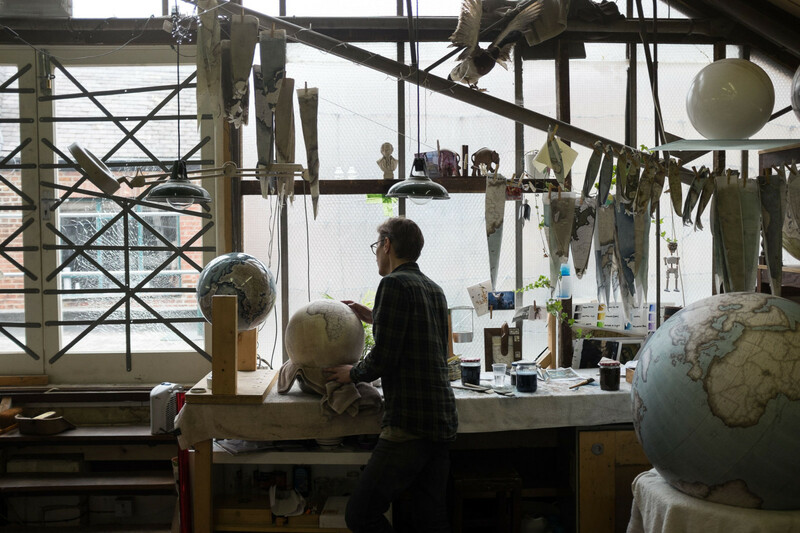 In the Bellerby & Co. globe-making studio, strips of paper with sections of world maps hang from the ceiling while paint dries. Different sized globes line the studio walls and tables, all in various stages of production. 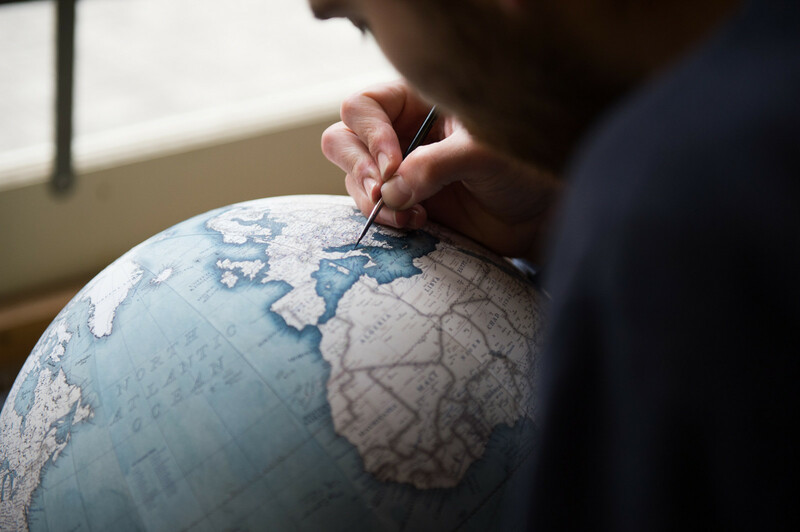 The office is situated in a light-filled warehouse building in London’s borough of Stoke Newington, and it’s where we meet with this leading purveyor of beautifully hand-crafted world globes. How long has the production for Bellerby & Co. been located at this studio? We first started in my home, and then we moved into a temporary spot. After that, we were fortunate enough to find this studio and have been here ever since. In the beginning, I thought it would be much easier than it was. I felt like it would maybe take me about four months and cost a few thousand pounds, and it took almost two years! What was the actual process behind starting the company from the ground up? How did you figure out the construction? There are various processes you have to go through. You really have to start with the actual construction of the stand for the globe. So we began with a traditional wooden stand model — that was the easy part. You have to work out a brass meridian and all the various pieces that make the globe sit just so. It has to sit on the axis so that the North Pole is in the north and the South Pole is in the south. The main challenge was constructing the spheres out of the Plaster of Paris and making those perfectly circular. And after that, we had to work out how to attach the map to it. In the end, that’s the thing that really took the most time. Some of the map will be hand-painted before we paste it to the sphere, and the majority is painted afterwards. The paper is in strips, and we place the pieces onto the sphere one by one. When the globes are finished, we let them rest in a hard case. I was looking for a globe to give as a gift, and I realized there wasn’t anything available that was exactly what I wanted. I couldn’t find anything that was hand-finished. That was the fundamental thing to me from the start — having everything done by hand from the very beginning to the very end. That’s really what we believe in at Bellerby, and so we put a lot of effort into each process. Especially the painting. It can take days, or weeks to finish a single globe. There are so many details. For example, the ocean can take days in itself. The painting of the sea is actually done before the map is put onto the globe, because it’s so extensive. How many people work at Bellerby? There are eight of us working here together right now. We need to expand because we’ve actually already sold out for Christmas! We’ve been sold out for quite awhile, so we’re looking forward to a very busy couple of months. I’m sure it must be challenging to make each globe sit just perfectly. How does that work? In the end, it’s all about balance. Everything is. We measure out and find the very heaviest part of the sphere, and sometimes unfortunately the South Pole comes down to the north, or it sits unevenly on the axis. It’s very difficult to achieve the perfect balance, but that’s what we’re after. Scaling is pretty interesting, too. One of our bigger globes is 50 inches, which is 127 centimeters. That makes it exactly 10 million to 1 in scale. So scale wise with the larger globes, if you’re standing behind the sphere in a photograph, it makes it look like it’s the right size. If you’re standing in front of it, they look much smaller than they actually are. It’s odd! What’s behind the painting process? How do you choose the colors you use for each globe? Our smallest sized globes are offered in specific colors that we’ve come up with and mastered. As the globes get larger and become more customized, our painter will be in touch with the customer so they can figure out the exact colors together. They find the perfect colors and hues that they want through trial and error. She keeps a color notebook with samples of each finished product — all the globes we’ve made are in the book. Shades of turquoise and blues and greens are obviously very popular. But we can even paint the globe purple if you want! It’s all about personal preference. She literally has every globe that we make documented so she knows exactly what she’s done, and she can go back and see what she did to make those specific colors. Before you opened Bellerby & Co. you had a bowling alley/night club sort of spot in London. How did you transition from that business to what you’re doing now? To be honest, I kind of get bored with doing the same thing for long periods of time. Throughout my life, I’ve had each career for a couple of years in most places. I need change. It certainly is quite nice to be able to change positions often and try different things. I’m very lucky that I can, and I’m sure that many people, given the opportunity would change their careers as well. So I enjoy doing new things. But with this one, I think I’ll stick with it for a very long time. It’s wonderful. Do you have any type of art background or training? No, not really. My grandmother taught art, and my mother still paints quite a lot. I did some art myself when I was in school, but I didn’t even consider that art was something I could go into as a career. I probably would have gone straight into something creative, had I realized I could make it work earlier in life. You send your globes all over the world these days. What are some of the most interesting places they’ve ended up? They go everywhere! I actually just took one over to Brazil recently. I was lucky enough to be going there, so I delivered it. We’ve sent them all over the world, though. But I’d say one of the most interesting places is India. If we send a globe there and it has the wrong border on it, then I could be put in prison for six months! You have to make sure the border is done as the Indian government sees the border — if you send it incorrectly, it’s bad news. There’s a disputed border there, so you have to just be aware. It’s just a little tiny border, so it’s not difficult to do on the map. Our illustrator takes care of it, but we just have to make sure it happens! That’s why we’ve got a bank of computers. We have files with different borders, new updates, changes with states and names. They also have gone to movie sets, TV shows, and bands. We just got one back yesterday from the band Rudimental here in London. They wanted one for their new music video! We just recently were commissioned by the Louvre museum in Paris to remake a globe. It’s a celestial globe from Louis XIV from the year 1684. They have the original copper plates, and it’s going to be a huge, really massive, design. We have the prints. It’s actually way bigger than any of the ones we have here. We’ve started working on it already, because it will take a very long time to finish. The museum has the original copper plates which are in pristine condition. They’re over 300 years old, and they’re beautiful. They’ve decided that they want to hang it above the big staircase, because it’s obviously the celestial area. So then, we’ll also do a collaboration where you can purchase smaller versions of the globe in the museum. It’s exciting. They actually want us to also use their celestial globe as our own, so we can collaborate and sell them together from now on hopefully. Do you have about a million globes at home? No, honestly I don’t. I work with them here all the time, and I’m very lucky to be surrounded by them all day long. I guess I try to separate myself from my work a little bit while I’m at home. I’d really love to have one of our very large-style globes in my flat, but it won’t actually fit through my door frame where I’m living now. Even if I took the door off the hinges, it just wouldn’t fit. So I guess I’ll have to wait. When you started crafting your first globe, how did you figure out what to do? You had no instruction, or any models to really follow. From the very first construction to the painting, I did everything in the beginning. I have one or two of those globes upstairs — they’re not the best, I must say. I think that was one of the drivers for me. I didn’t really like school when I was younger. I didn’t like being told what to do, honestly. So the best thing about this type of work is no one can tell me what to do because there’s no one in the world who actually knew how to tell me what to do. To me, that’s been one of the best bits about it. Working from the beginning to craft something new is certainly a nice, fun way to learn. I must say though, it was equally stressful at the start. I was very lucky that there were various moments that happened along the way that were completely by fluke, and they enabled me to save a lot of time and money. Thankfully, I was able to achieve the end result. It still took a much longer than I had anticipated! Did you ever have a moment when you wanted to quit, or was the process always forward moving? I guess after about a year and a couple of months, I had already spent well over £100,000. At that point, I told myself there was no way out. Really, there was absolutely no turning back. I had a beautiful old car that I had to sell, and I knew at that point that I was really invested in the process. I was hook, line and sinker. I actually told way too many people at the beginning, as well. So after a couple of months they were all pushing me to do it. As soon as I told all of those friends, I had to keep going. Sometimes it’s quite good to tell people that you know won’t let you give up. When you’re staring at a map all day, you must become very aware of geography. How do you keep up with changes? We definitely have to study and stay up to date. There’s no official organization that actually charts geographical changes for maps and globes, so we have to research things to stay very well informed. A good example is India. They have this great thing they like to do, where they just change state names without any warning and really for no reason. There’s a very famous state called Orissa and they changed it about four years ago to Odisha. It was very much under the radar, because this was such a well-known state and they just decided it was time for a new name. So we definitely have to always read up! Quite a lot of the tiny islands will change frequently. Places like Canada and Australia rename things a lot, as well. Or, for instance, President Obama recently renamed Mount McKinley in Alaska to Denali. Obviously American news organizations would be on top of that, but those are small things that often fall under the radar in other countries. Unless you’re making globes, you probably wouldn’t care much. Do you have a favorite place that you’ve traveled to? India, really. Everything about it is so incredible. The smells, the sights, the sounds. Everything. Truly. It’s simply amazing. I once got to go on a motorbike trip across the country, and I traveled around for awhile. They have this amazing bike style that hasn’t really changed since the 1940’s, and it’s really really heavy. So it sounds, I guess it makes a Harley sound, that tiny, squeaky little thing. It goes doom doom doom doom doom. The engine is huge! It’s just so cool to drive around and experience a country that way. There are deserts in the north that you have to travel through, and when you get to your destination you look absolutely mad. You have the googles and the dust all across your face. It’s just amazing. Really, it’s the greatest thing! You’re covered in soot, like out of a movie. To drive there on the dirt roads, among all the crazy cars, it’s so exciting and also frighteningly dangerous. For each village, they have these bumps in the road that mark the entrance of the place, but the bumps aren’t marked at all. So you come up on the road bumps and end up not seeing them and flying across them at 60 kilometers an hour, or something. I did the ride with a passenger, so you hit these massive road bumps going fast and my passenger would sometimes be up on top of my shoulders! It was mad. Really, it was the best travel I’ve ever done. I also took a train from Mumbai that took 38 hours. It was a slow 30 miles per hour train. They have sirens at every station, too. They go off before they get to the station, when they get to the station, after they leave the station. They’re always ringing! So you have that constant buzzing sound in your mind. It’s everything you’d imagine and more. What’s the best part of globe-making in your opinion? For me when I’m making them, putting on the final piece is the very best part. When you’re making each globe, you’re using fine paper and stretching it. At any stage, it can tear. You can damage it. So until that last piece of paper — there are 50 pieces of paper total — is placed on the globe, you have to be so meticulous. You can still definitely damage it until that very last bit is on. Effectively, the last main bit of paper is Eastern Russia. And then you have the North Pole and the South Pole. I love seeing the whole world come together in the end. What do you like most about globes? There’s something so timeless and beautiful about them. They kind of have this ability to take you places, don’t you think? Absolutely. Like you said, maybe it’s just nice to be able to look at something and feel a bit transported to different places. We’re also really so lucky to have such a beautiful studio where we work. It’s wonderful being in this environment, surrounded by globes every single day — even in the basement dungeon! Most people don’t have that. They have a computer screen, a bank of computers, an office cubby. So actually working with globes and maps, it makes you dream of where you want to be or visit or go. All the places you want to see. And you find new places you’ve never even heard of. It makes you realize the scale of things, as well. Like all the tiny islands in relation to big places. They’re so very small. As we scale things up, we have to focus on that aspect a lot. It’s interesting to see different places and how they sit in relation to other places. Our world is so large! Thank you so much Peter for sharing your incredible stories and showing us around your beautiful studio. More information on Bellerby & Co.’s artisan globes can be found here. See more creative endeavors happening across London in our portraits from the bustling city.